Hi everyone. I needed to make six quick cards to send to friends and I wanted them to be the same design, just switching up the ink colours. 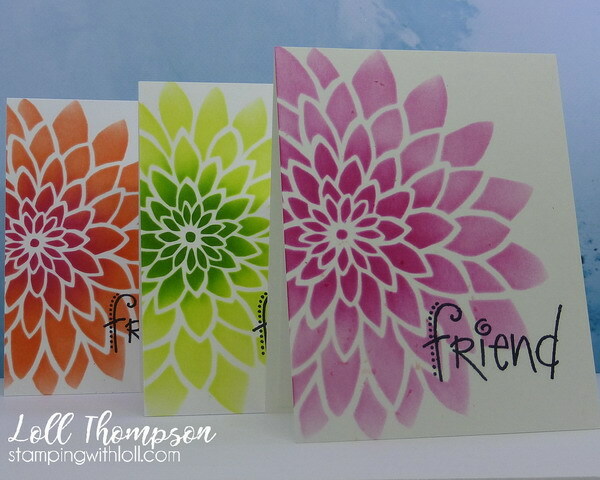 I used a large bloom stencil and made the cards above in about 5 minutes per card. You gotta love that!! Super quick, easy and fun. I shared a CAS version HERE. I actually made these cards first, but wanted to wait until they were received before posting. 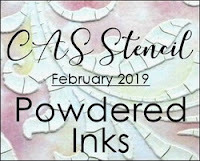 I'm also thrilled that today, my Stencil Sponging video goes live on Splitcoaststampers.com. 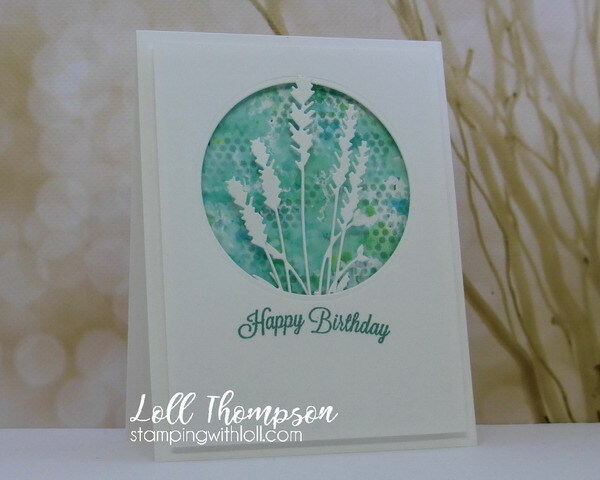 My video shows how to sponge over stencils as I did above. Thanks to Dina for wanting to share my video with members of the Splitcoaststampers community! I secured an A2 (4 1/4" x 5 1/2") white card front to my craft mat, placed the large bloom stencil over top, with it hanging off one side and secured it with temporary tape. Then I used sponges and distress ink to sponge over the stencil, starting with the lightest colour to cover the whole image, and the darker one added on top, just in the center. To finish I stamped a fun sentiment in black and then adhered the card front to a base. Ink: Distress Inks from Tim Holz. Colour listed under photos. Hi everyone. 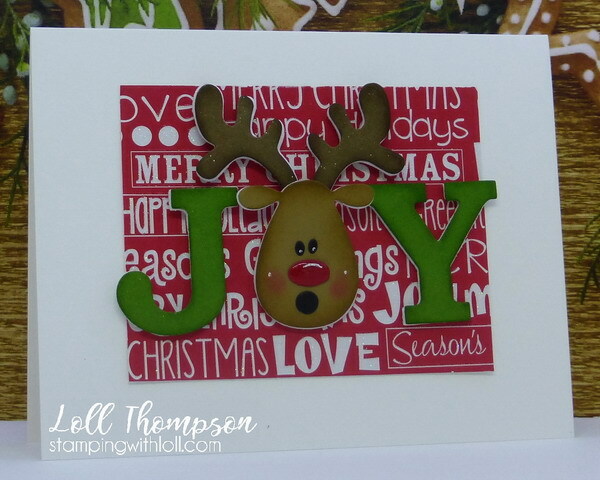 Today I'm playing along with Rudolph Days February Challenge! Maureen is once again hosting a year of Anything Goes Christmas challenges that run on her blog from the 25th until end of month. 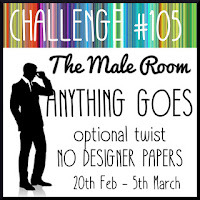 I love to play along with this fun challenge. I used a NBUS reindeer die to cut out just his face and antlers from coloured card stock. Sponged around the outside of all the pieces in a darker co-ordinating ink. I used clear wink of stella on his antlers, crystal glaze on his nose, chalk for his cheeks and then did a few highlights with my white gel pen. The reindeer is mounted on a layer of foam to pop him up from the fun, patterned paper background. I used a second die (JOY) to cut out the J and Y from red paper, again sponging around the outside of the letters and adding wink of stella before mounting onto foam. Hi everyone. I'm back with my final share using the new release from Penny Black - Timeless. For my last post, I'm sharing a beautiful flower image, 40-680 at grace, using the no-line watercolouring technique. I started by inking the image in a very light blue. 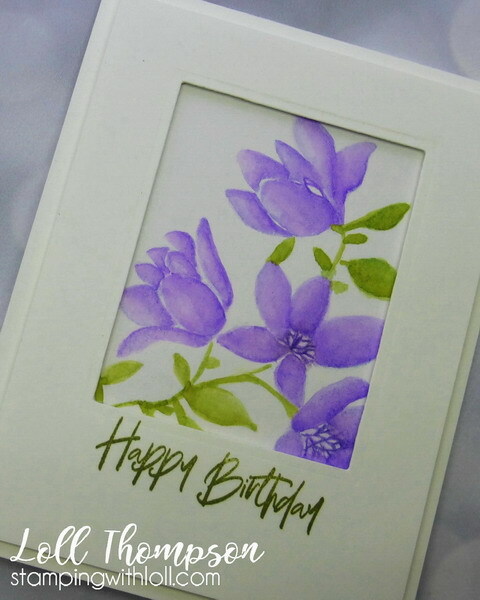 It mixed really well with the purple ink to create lovely colours for the flowers. I used just part of the image and framed it up in white to create a CAS (clean and simple) design. I masked off part of the sentiment, 30-541 good wishes, using just the Happy Birthday stamped in the same ink colour as the leaves. Thanks for stopping by for a visit! 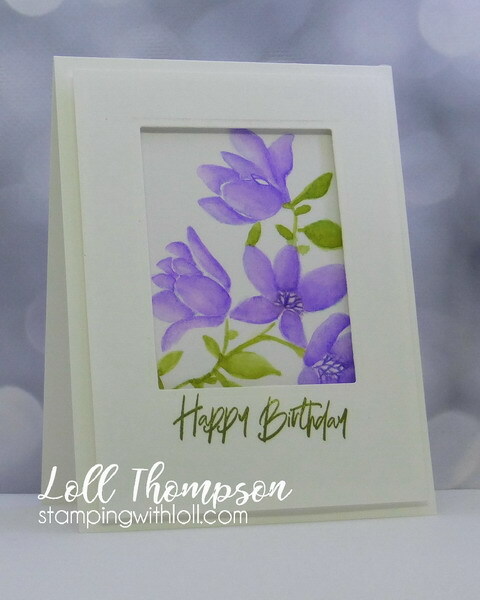 I hope you enjoyed my cards using the new Penny Black release - Timeless! Hi everyone. Just a quick post. Sorry I've been posting so much lately, but have had A LOT to share. :) Today is my 40th wedding anniversary! I wanted to share the card I made for the sweetest man on earth, hubby Gord. He loves blue, so a blue heart it is! (my dear friend Dolly enabled me)! 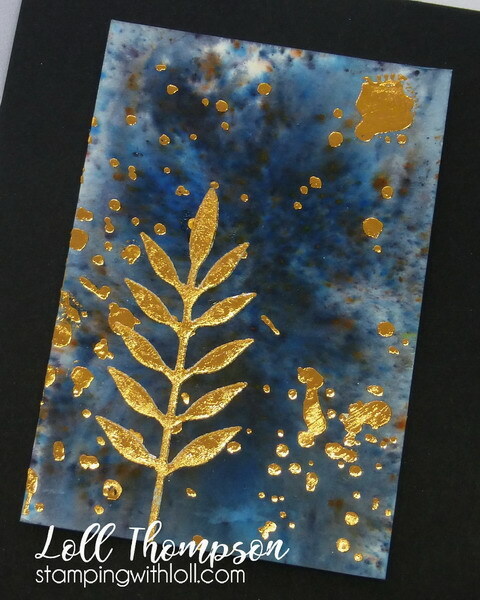 I did a quick smoosh of blue magicals for the background, and stenciled with gel medium (specially make for deco foil transfer) through a stencil. 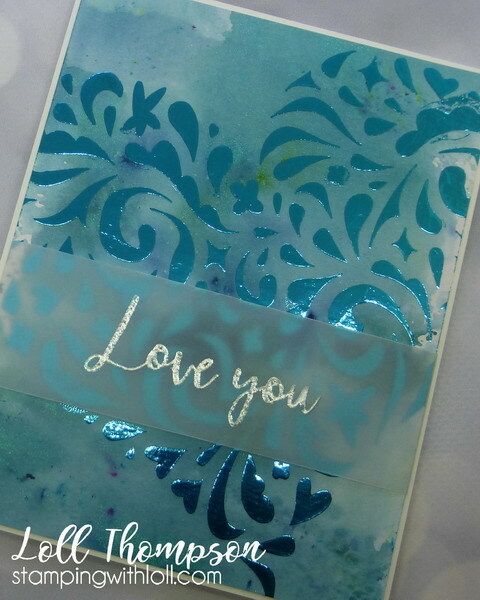 Once the gel turned clear, it was ready to add the turquoise foil on top ... fed it through my laminator ... voila! Gorgeous! Added a vellum banner with silver heat embossing to finish. Hi everyone. Back again today with some more sweet new images from Penny Black's new release - Timeless. 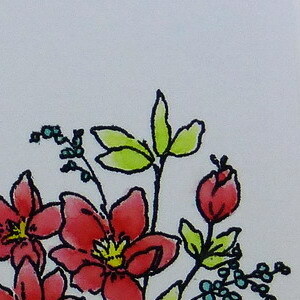 My first card I'm sharing uses watercolouring with Zig Clean Clear Markers. 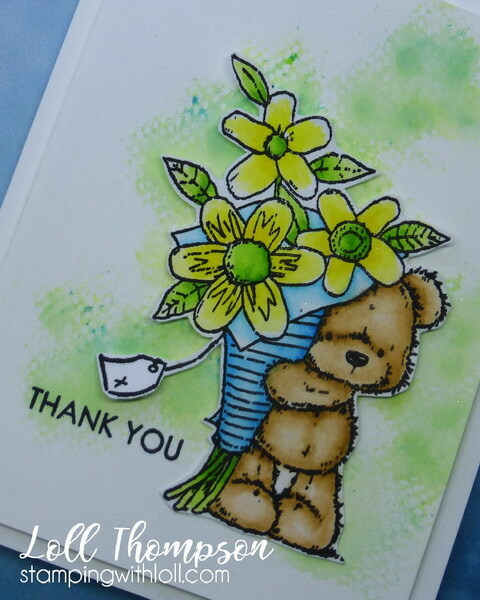 I stamped the sweet image (30-543 flower teddy) in permanent black ink and set the ink with my heat tool before colouring. I used zigs and a water brush to watercolour and then fussy-cut the image. I popped the teddy over top of a paper towel transfer background I had in my stash. I made this with transferring ink from a mop-up paper towel onto a card front. 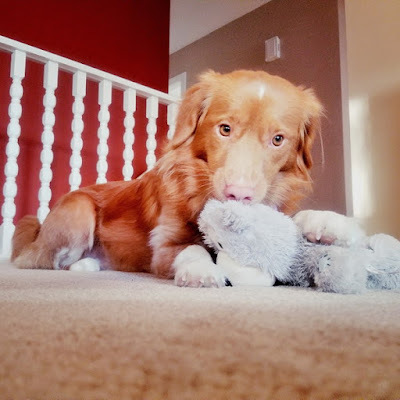 Isn't this little guy the cutest??!! 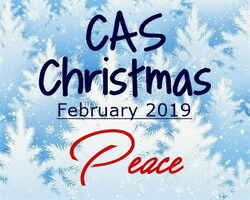 For the second card, this is a pretty, CAS card that was fun and easy to make. I used one of the silhouette images from 30-563 floral silhouette. I lightly stamped the flower head randomly over the background of my main panel. Then inked the whole image again, spritzed with a little water, and stamped over top. I cut the image with the 51-517 square frames die. Inlaid my coloured panel to the frame and then added a second die-cut white frame over top. 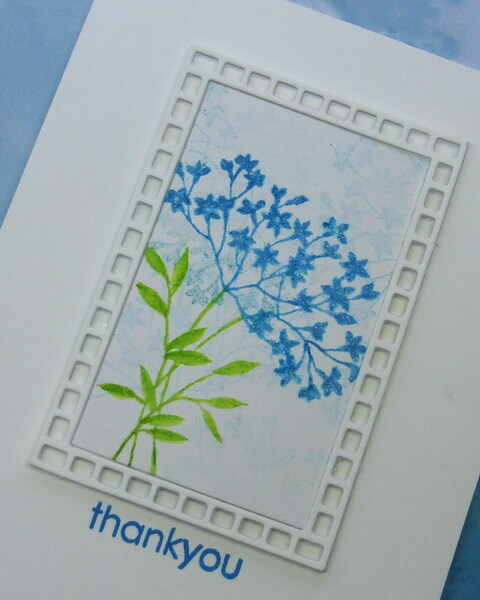 A simple stamped sentiment, 30-560 from the garden, stamped in matching blue, finishes the card. I hope you've enjoyed the cards from today. Hi everyone. I broke down and bought a laminator. :) I was on the fence about it for a while, but I'm glad I went ahead. Had a play day a couple of days ago with Christine, Susan and Trina. One of the things we did was play with Christine's laminator and we figured out what way works best for us. 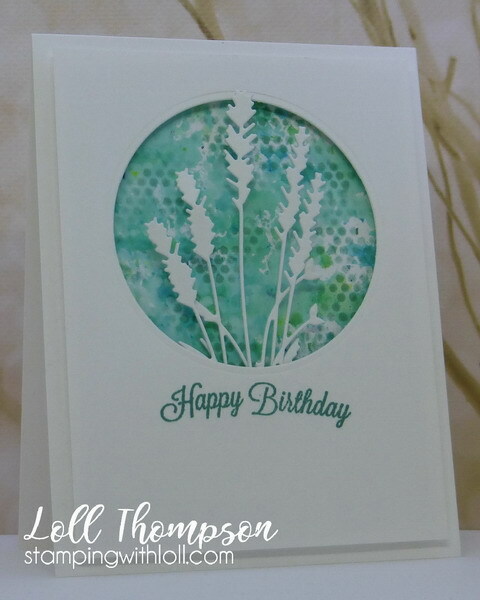 We watched a few videos, and in the end we tried the gel transfer, heat and stick powder, and white embossing powder. The gel transfer was the only way we got consistently good coverage. And we used a carrier sheet (piece of copy paper folded in half) to get it smoothly through the machine. I had a snippet of black brushos background in my stash. Over top, I stenciled speckles using the gel transfer medium and palette knife. It had to dry clear before I could add my foil (about 1/2 hour as I put a thin coating on). I added copper foiling which I think worked perfectly. Also die-cut the leaf sprig and using double sided adhesive. Added the copper foil over top. The shine from the foiling is incredible! Hi everyone. 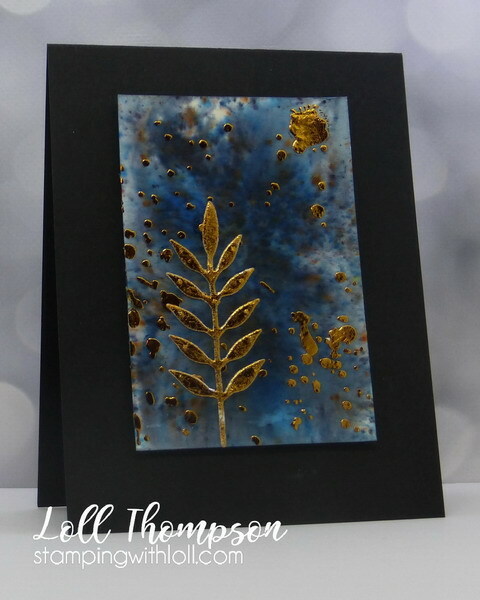 I'm excited to be sharing cards I've made using the new release from Penny Black called Timeless. 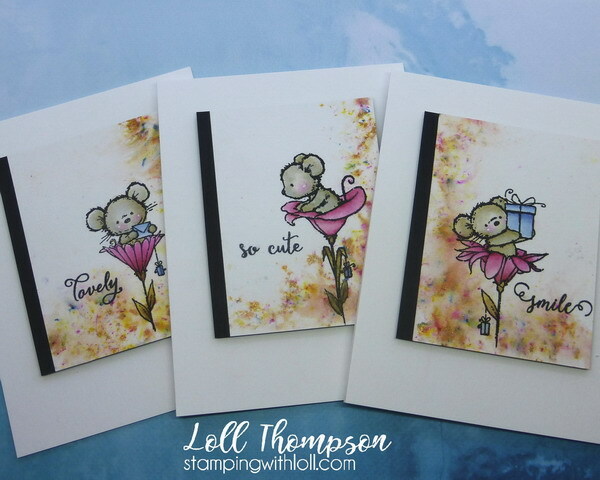 I'm starting off with sharing three cards all made from the same stamp set, 30-542 critter celebration. 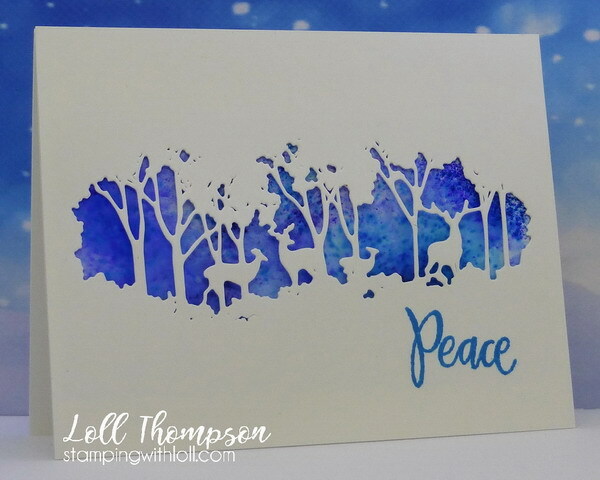 These stamps are adorable and I had fun making a series of cards that all use the same layout and start with a dreamy, colourful background made with shimmery powdered inks. Each of the images is stamped in black permanent ink and watercoloured using distress inks using a water brush. These adorable mice make me smile! To finish, a little highlight of pink for the cheeks with a white gel dot. I hope you enjoyed my three cards from the critter celebration stamp set. 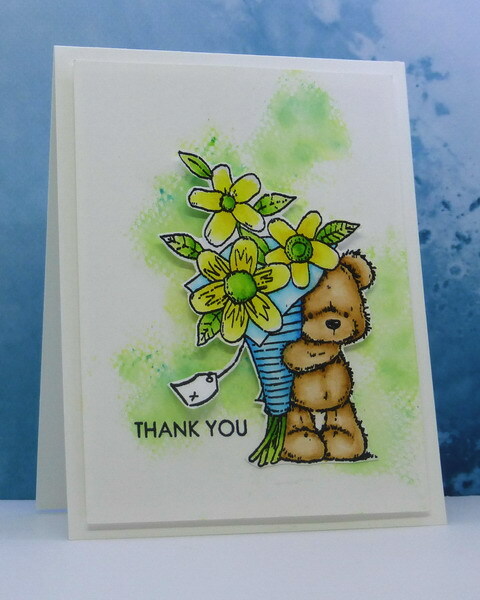 I'll be back in two days with another post of cards using more of the Timeless release from Penny Black. Hi everyone. Had a play day last weekend with my CAS team mates, Susan, Christine and Trina. We tried out a few new things and one was using rubber cement with stencils and watercolouring. Rubber cement is an old fashioned product that is very inexpensive to use, but it does have a strong smell, so best to use it in a well ventalated room (or even outside if the weather permits). We followed the instructions on this video tutorial and it worked great! 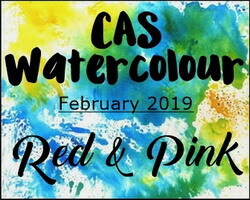 For my card I used red and pink to watercolour the roses, so I'm adding this to the CAS Watercolour challenge gallery for February. There's still a few days left before the challenge closes at end of day Feb. 24th. Come check out the beautiful red and pink gallery ... it's really something to see! I really like this technique and will definitely do more cards. I thought this turned out really well for my first try. Hi everyone. 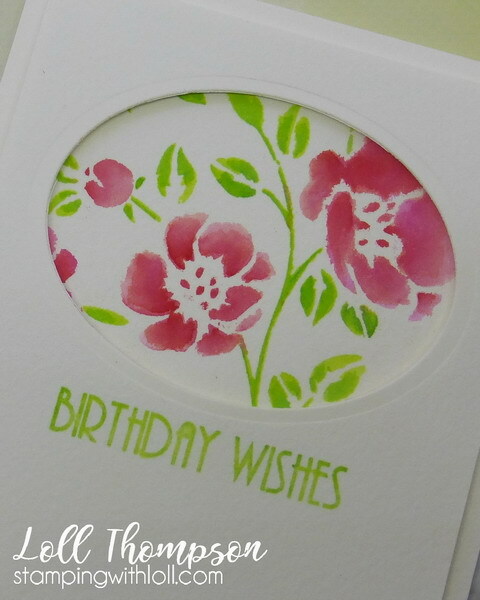 I'm back again sharing a little sneak peek of my Penny Black card that is posted on the Simplicity at it's best blog. Click HERE to check out a full-size photo of my card, along with complete instructions on how it was made. I hope you'll stop by the SAIB blog to check out my card. Thank you! Hi everyone. 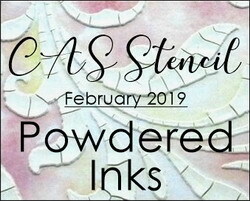 Time for a reminder for the CAS Stencil February Challenge. Today's card I made for a very special friend a while ago. 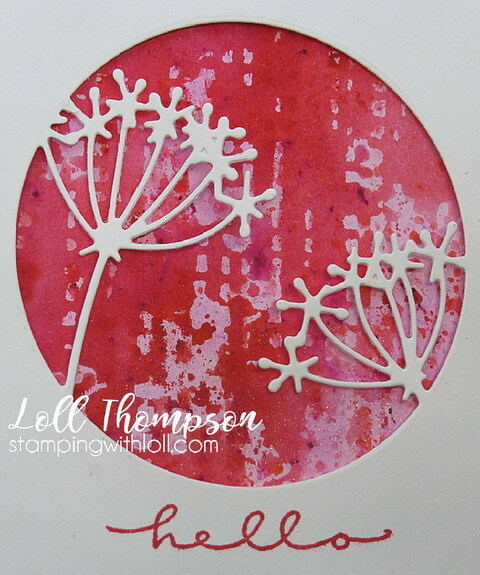 I started with the stencil monoprint of a mini tiny circles stencil using Lindy's magicals. I love this teal colour with all the shimmer (which doesn't show in the photo, unfortunately. After everything had dried, I place the same stencil over top of the background and sponged on some Evergreen Bough Distress ink ... those are the darker circles that you see in the background. I stamped the sentiment in the same in on the card front with a circle aperture. I die-cut two of lavender flowers, and arranged them in the circle so that the tallest is just outside of the circle. Come check out our challenge post to see the other reminder cards from our very talented Designers and all the entries so far this month. Lots of inspiration! Then come join us. Hi everyone. Time for a reminder for the CAS Christmas February Challenge. This month, Colleen is hosting and she has picked a wonderful challenge for us! 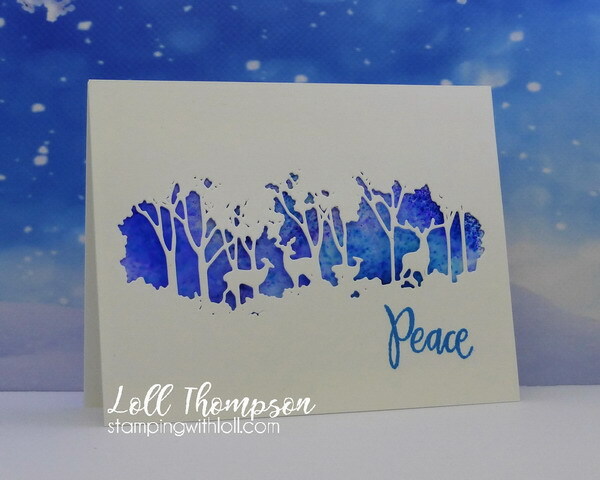 I die-cut the forest scene from a white card front and adhered a piece of mixed media with brushos in-behind. The brushos piece was in my stash, which made this card even faster to make! 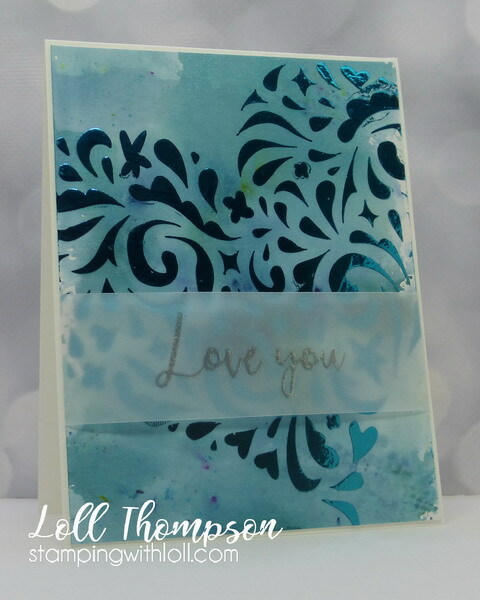 :) Adhered the card front with scene onto a base and stamped a simple sentiment in blue. I hope you'll check out the challenge blog to see the new reminder cards from our wonderful Designers and talenged Guest Designer, Linda. I know you'll be inspired to play along! 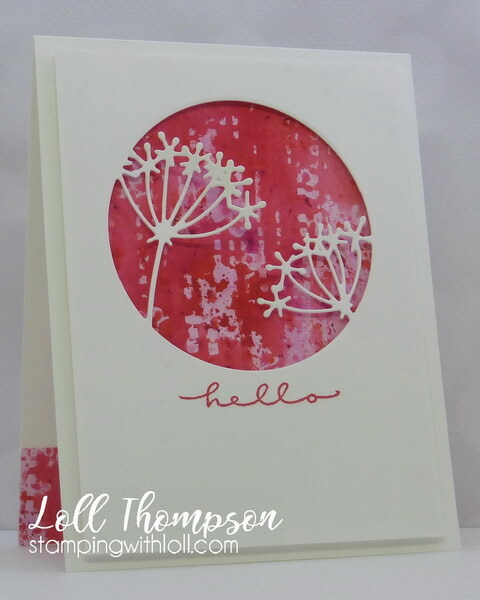 Stamped a sentiment in Candied Apple Red which matched the colours perfectly. Used a 1 1/4" strip of leftover monoprint to add to the bottom inside of my card.